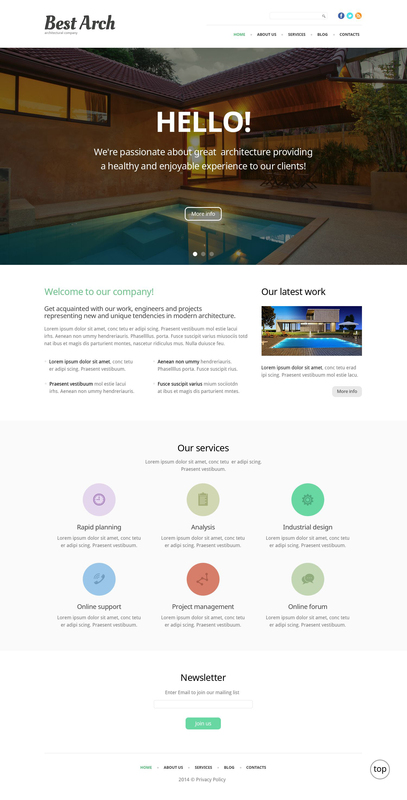 Best Arch is a Bootstrap-powered Architectural WP Theme running on Cherry Framework. It will be a perfect starting point for developing architecture, exterior and interior design, gardening or any other website of this kind. The template features a clean and minimalist layout with plenty of white space, which draws users' attention to your content. A fixed navigation bar will provide your visitors with quick access to the rest of the pages of your site. Drop down menu, drop down cart and back-to-top button were integrated to facilitate navigation. A full-width header slider not only makes the theme look trendier, but also introduces visitors to your business. A fully responsive layout will run smoothly on handheld devices, whereas lazy load effect provides for faster page's speed performance. Online chat along with tech support may be a signal for the clients - â€œthis specific provider truly worries about meâ€. The internet users don't really need to wait a long time for their ticket to get resolved or undergo lots of documentation to obtain the answer for himself. Friendly technical support consultant is going to answer him quickly and definitely will solve his issue in a virtually no time. Is there any return policy for WP themes for Photography News ? As a web developer, I used this template to build a website for a client. The ease of use in modifying these templates is incredible...not to mention the great resources on installing these templates on my server. Can i change the text for every slide?